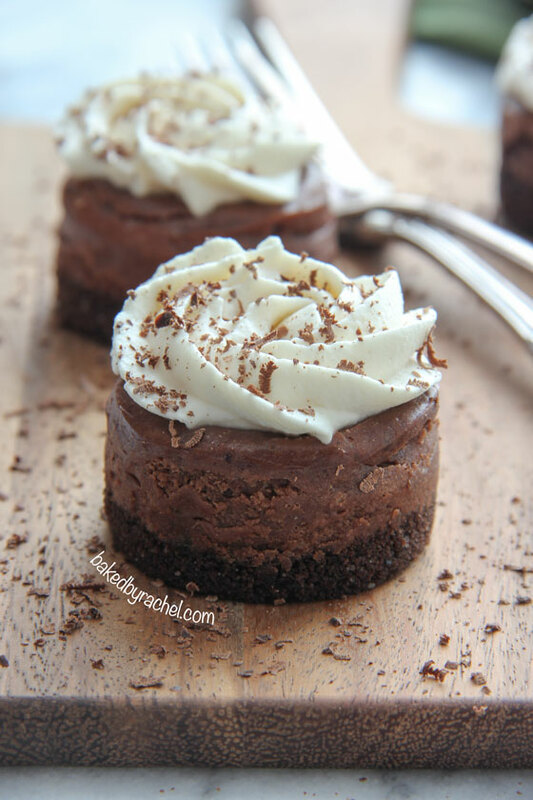 A recipe for mini chocolate cheesecakes flavored with Bailey’s Irish cream, topped off with fresh sweetened Bailey’s whipped cream and chocolate shavings. A perfect dessert for St Patrick’s day celebrations. Last night I was having a fun nostalgic night, playing music from the past. Usually when this happens, it turns into me quizzing the Mr to see if he can guess the song and/or artist in a reasonable time (or totally unreasonable). It’s always an entertaining time. Whether it be shocking him by me knowing the lyrics to certain songs or him cracking me up by his obvious desire to not admit to knowing certain songs. We all have those songs. Songs from the 80s are just too entertaining to revisit. In more entertainment talk… we watched Catching Fire over the weekend and even though I had already seen it, no one else had… totally enjoyed it, obviously. If you loved the first, then you have to see this one. In the beginning they gave a nice tease to Divergent, which I’m totally looking forward to. Hopefully the rumors about ticket sales being better than Twilight are false, but I’m sure I still won’t wait too long to see it once it’s out. Will you be seeing it? With St Patrick’s day being basically a week away, it’s time to share my final festive treat. I made these weeks ago and have been itching to share them with you. No ifs ands or butts, you need these mini cheesecakes in your life. 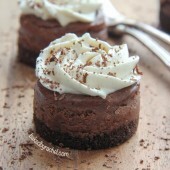 These mini chocolate cheesecakes are the perfect two bite dessert for your holiday plans, big or small. 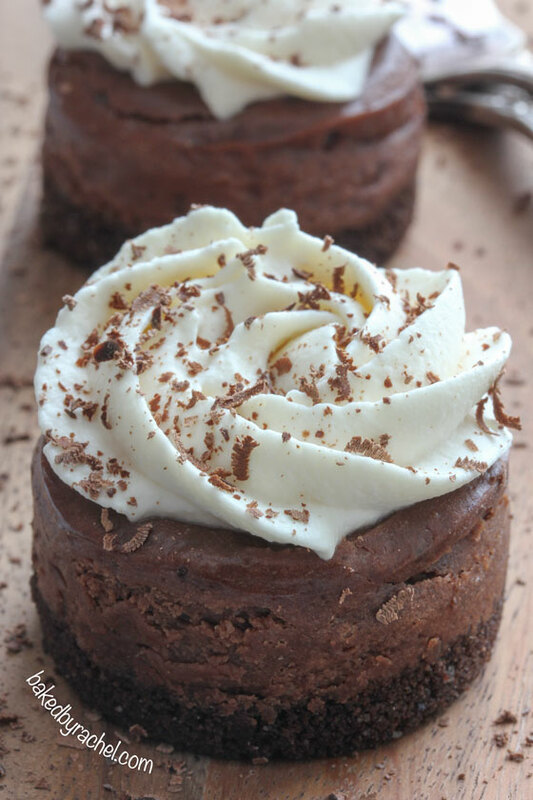 They feature a rich chocolate crust, topped of with creamy Bailey’s Irish cream chocolate cheesecake, homemade sweetened Bailey’s whipped cream and chocolate shavings for the perfect finishing touch. Be sure to add these cheesecakes to your St Patrick’s day menu and check below for more festive recipes! Mini chocolate cheesecakes flavored with Bailey's Irish cream, topped off with fresh sweetened whipped cream and chocolate shavings. In a medium bowl, beat heavy cream until stiff peaks form. Beat in powdered sugar and Bailey's. Pipe or spoon onto chilled cheesecakes. Top off with chocolate shavings, if desired. I want some os these on St Paddy’s Day! 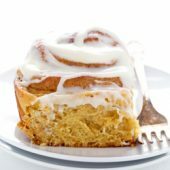 Can these also be made in a regular 9 x 12 pan? This recipe was written specifically for the mini cheesecake pan. The amounts listed would not work for a large pan, as you mentioned. Alternately you can follow the directions while using liners in a muffin pan, but be aware that the overall size will be different than shown here. haha I can see you being totally confused over older songs. I imagine there are songs you’re way more familiar with than I am though! This looks like the perfect St. Patrick’s Day dessert…delicious! What a terrific idea for cheesecake! Thanks for sharing! Fantastic! These are amazing! I seriously need these in my life! 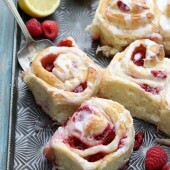 G’day How scrumptious do these look today? YUM! I could go for one right now! Oh my gosh!! Bring it on!! 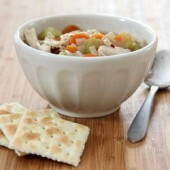 I’m ready to eat a few of these! 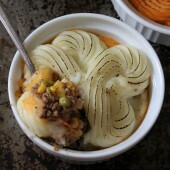 There are so many recipes I want to make on food bloggers websites- but I think this is one I HAVE to bake. And it doesn’t look like it is terribly complicated (yay!) Pinned and hopefully soon….baked! I could care less that it is St. Patricks day, I just want one of these cheesecakes! Thanks Mallory :) You should make some! ohmygoshtheselooksoamazing! Stop me before I do something completely uncouth and lick my screen. 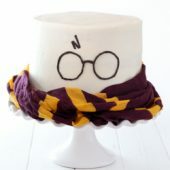 I can’t wait to make these. So cute. So decadent! Pinned to two different boards just in case I can’t find them later! 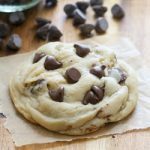 Yeah, I’m definitely going to need to make these asap. I’ll need something to help me recover from midterms over the spring break. Pinning for later. Thanks for the post! Thanks Ash! Enjoy :) and good luck with midterms. 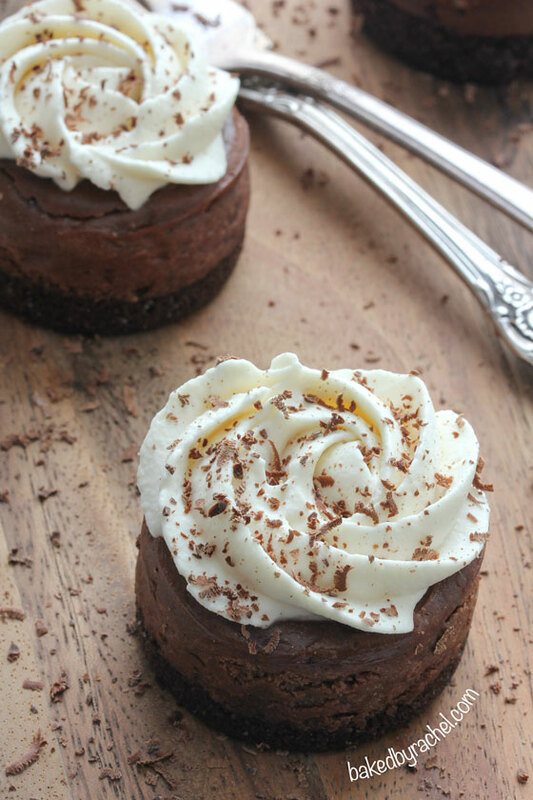 Chocolate cheesecake is my favorite thing on the planet – love love love these! They look delicious!! Bailey’s cheesecake of any kind is always so good and yours always look perfect! 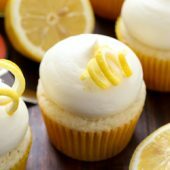 these look adorable and delicious! is there any need to put the tin into a larger pan of water when baking? i wasn’t sure if it needed to be baked like a traditional cheesecake. I definitely need more cheesecake in my life. True story! You always have the best and most perfect looking mini cheesecakes! I am sure these tasted fantastic! What a great idea! It’s really out of the box for the holiday, and your pics are amazing. Hi!! This just got tweeted by Tessa Arias – and I trust her judgement completely, so I’m definitely gonna try these! Question – how obvious is the Bailey’s taste in the cupcakes, without the frosting? The complaint that I always get is that you can’t taste the Bailey’s. Thoughts? If it’s not “obvious”, what’s a safe way to increase the Bailey’s without ruining the consistency of the cake? Thanks so much. New to this way of communicating. Will be following your site. Will let you know how my girls liked it. Question? In the directions you say to add vanilla, but I don’t see it in the ingredients… I’m guessing it’s 1 Tbsp as the others, but I just wanted to be sure. Sorry, just a typo. There is no vanilla in this recipe. Tried them today and they turned out delicious! Thanks for the recipe! Making these for a Christmas party. 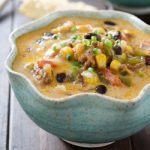 Can I use 1/3 less fat cream cheese or do you recommend full fat version? No, this recipe is specifically written for mini cheesecakes so the amounts, both with ingredients and cooking time, would vary greatly for a larger size. Making these for a bachelor party for 13…..I don’t have time for a do over, so when you say a medium scoop would that mean fill cup to 3/4 full? Yes roughly 3/4 full. Enjoy! Sorry for the delay, but these were so good! I wanted to save some cream for my coffee the next morning. I made two batches for a bachelor party thinking these were too small but no, after a huge dinner these were perfect, thanks!! I had to try one and since there were so many…….I turned around and stuck one in my mouth….oh yes, you hit it! Thanks for the update, Mary! So glad to hear you enjoyed them! could I use oreos instead of chocolate graham crackers? Yes, just be sure to still use the same measurements. Enjoy! I’ve never made cheesecake of any kind but I bought a mini cheesecake pan after seeing this recipe. How far ahead can I make them for a brunch? Day before? You can easily make these a day or more ahead. Just be sure to wait and top them the day of, for best results. I made this recipe, but I didn’t have minicheesecake pans. So I used a 7inch spring form pan. I followed all the instructions but the baking times. I baked the crust for 7 minutes and the whole 38 minutes. It turned out really good. 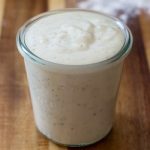 I just saw your recipe a few weeks ago and thought this would be great for Christmas dessert. My family is Irish and loves Bailey’s (which we drink at the holidays as well.). I made them today, Christmas Eve. My birthday is tomorrow and I am so looking forward to sharing these with my family.. Merry Christmas and Happy New Year. Thanks for sharing. 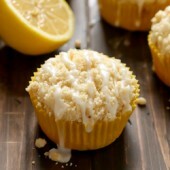 Has anyone tried this with mini muffin tins? Or even regular sized muffin tins? Just wondering if they turned out and how to prepare the muffin tins. You could definitely do these in a regular muffin pan. They’ll end up being a bit shorter and wider than they would using the cheesecake pan, but still just as tasty! I’d recommend using paper liners for easy removal. Enjoy!